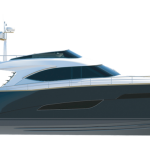 The Austin Parker 72 Fly is a yacht with classical yet sleek lines. Designer Fulvio De Simoni has easily included a flying bridge of considerable size in this 22 metre craft while still providing an aerodynamic, sporty profile: this is the boat’s open-air living area, for steering, sunbathing, lunching or relaxing on the chaises longues, two of which are also set into the main deck in the bows, fore of a vast sun deck which conceals large forepeaks. The eating area is outdoors, with a table and bench as well as a corner with wicker armchairs and a coffee-table. The entire deck, with teak flooring, offers excellent access and safety, as do the wide gangways leading down at the stern to the hydraulic platform, from which an airtight door leads to the crew cabin. On the outside the style is more classical, with a modern interpretation, while the interior is more contemporary, with no hint of traditional yacht furnishings. The materials used are gleaming bleached oak for the furniture and walls, combined with the Italian walnut of the companion-ways and floors and a profusion of leather in contrasting shades and natural fabrics. The furniture is in simple, elegant style with armchairs and sofas; the dining zone has an extending oval table all in plate glass and stainless steel. A central companion-way gives access to the sleeping accommodation. The large owner’s cabin is in the centre of the boat, while moving towards the bows there are two guest cabins on opposite sides and a spacious VIP cabin in the bows themselves; each cab has its own well furnished, functional en-suite bathroom. The materials used are exquisite below decks, too, with bright, contrasting shades: a variety of inserts, leather furniture tops, mosaics in the bathrooms, LED lighting and opening portholes throughout. The crew cabin is entered from the stern and gives convenient, direct access to the engine room. This roomy, functional area houses two 1400 HP MAN engines, with V-Drive transmission coupling. The yacht gives a sense of safety and stability at sea. When going about, the keel is well balanced and responsive, with minimum veering; fuel consumption is reasonable for the craft’s power. The flying bridge steering position and the look-out bench facing it are well protected by the windscreen, in spite of its low, streamlined shape; the yacht travels the waves firmly and smoothly, and the deck remains dry at all speeds.